This summer, Chicago will provide the backdrop when Miller Lite starts to rock the NASCAR� circuit. Once again, Rusty Wallace will drive a rock n roll version of his No. 2 Miller Lite Dodge stock car. This time around, the race car will include imagery taken from the California rock band Puddle of Mudd and their latest release, Life on Display. Wallace and Puddle of Mudd will team up aboard the No. 2 Miller Lite Dodge during the 400-mile NASCAR NEXTEL Cup Series race at Chicagoland Speedway on July 11, 2004. Last year, Wallace drove a No. 2 Miller Lite race car that featured the Goo Goo Dolls during NASCARs All-Star race in May and at Chicagoland in July. Action Performance Companies Inc., the leader in the design, promotion, marketing and distribution of licensed motorsports merchandise, will produce limited edition die-cast replicas of Wallaces No. 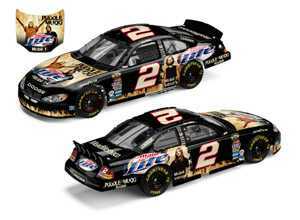 2 Miller Lite/Puddle of Mudd 2004 Dodge. Both the die-cast car and its packaging will include a variety of images featuring Puddle of Mudd guitarist Paul Phillips, singer-guitarist Wesley Scantlin, bassist Douglas Ardito and drummer Greg Upchurch. "Every year, it seems that the rock n roll and racing connection gets stronger," noted Fred Wagenhals, Action Performances chairman, president and CEO. "With these types of cross-market promotions, fans from both sides find common ground. Collectors also seem to enjoy adding the music-inspired die-cast replicas to their collections." In addition to showcasing the No. 2 Miller Lite/Puddle of Mudd Dodge on the racetrack, the band will perform a concert following the NASCAR qualifying event on Friday, July 9 outside of Chicagoland Speedways Turn 4. The concert is slated to begin at approximately 5 p.m. and should run until almost 7 p.m. For more information about Puddle of Mudd, including news, events, tour dates and other band details, visit the official Web site at www.puddleofmudd.com.